Pre-Shampoo Oils to Help Protect Locks While You Lather! You've known your hair for a long time, so chances are you already have a pretty set routine when it comes to washing and caring for it. What you might not realize, however, is that your shampoo process could actually be damaging your hair by stripping it of its essential oils and causing more breakage than necessary. Yes, there is such a thing as hair that's too clean, but don't fret – pre-shampoo oils are here to help us lock in the natural oils our hair needs to stay healthy while locking out the harmful detergents found in shampoos... and of course, getting hair clean without going overboard. Pre-shampoo oils are simple – just comb in and let it sit in hair for a few minutes, then shampoo as usual. The oils and proteins help coat the air to maintain moisture and shine, as well as detangles, preventing breakage during the actual shampoo process. Hair is healthier, shinier, more protected, and just the right kind of clean! 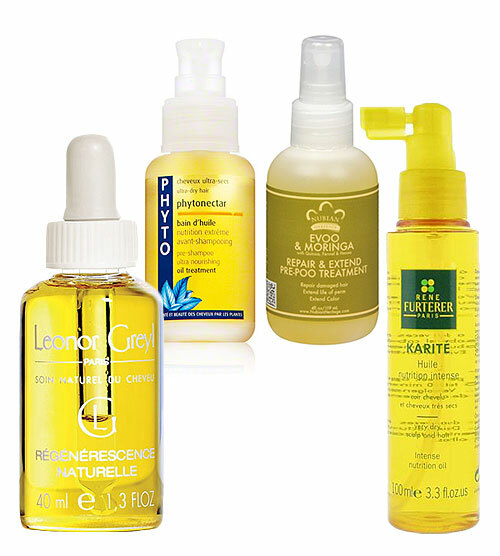 From left to right: Leonor Greyl PARIS Pre-Shampoo Treatment, Phyto Phytonectar Ultra Nourishing Oil Treatment, Nubian Heritage Repair & Extend Pre-Poo Treatment, and Rene Furterer Karite Intense Nutrition Oil.